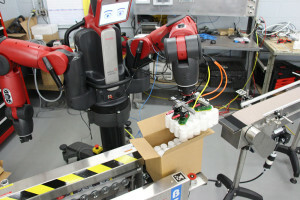 The Baxster robot by Rethink Robotics is programmed to package boxes at the Omega Design Corporation in Exton. In September, the robot will be moved to the TCHS Pickering Campus and used in the Electronics and Robotics program. Robots are coming to the Technical College High School (TCHS) Pickering Campus. Specifically, the Baxster, a collaborative robot designed by Rethink Robotics. With a modern red and black body, an expressive face made from an iPad, dual arm capabilities and easy programming capabilities, the Baxster will become an integrated part of the curriculum in the current Electronic and Robotics and the new Advanced Manufacturing programs at TCHS Pickering. The Baxster is currently housed at Omega Design Corporation in Exton, Pennsylvania. TCHS purchased the robot in partnership with Omega Design to explore the possibilities of collaborative robots in advanced manufacturing and develop applied learning curriculum for students. Omega Design specializes in the design, manufacture, service and support of packaging solutions for pharmaceutical and consumer healthcare industries. 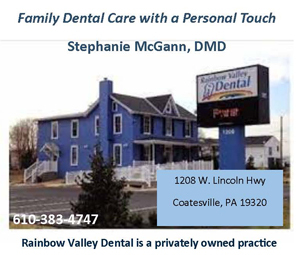 The company serves clients such as Teva Pharmaceuticals, Merck, GlaxoSmithKline, Johnson and Johnson, L’Oreal, Estee Lauder and Proctor and Gamble. Once the Baxster is moved to TCHS Pickering, Omega Design will continue to be involved in training students and developing curriculum. Representatives from the company serve on the school’s Advanced Manufacturing occupational advisory committee, a new program that will open in 2017, and the local advisory committee for the upcoming school renovation. The company also plans to challenge students to develop solutions to real-world work experiences and problems. TCHS and Omega Design chose to purchase the Baxster specifically because it is a collaborative robot. Most industrial robots are locked into a cage with a large guard package around them for safety reasons. In comparison, humans can work side by side with collaborative robots, and they can be easily moved from one packaging line to another. The Baxster is also extremely easy to program. “You don’t need an advanced computer programmer to write a new program when you want the Baxster to do something new,” said Charles Chan, a control engineer for Omega Design. “You can program the robot directly on its arm. It is much more user-friendly.” In addition, the Baxster also has dual arms that can work independently of each other. It can complete two separate and distinct tasks at the same time. TCHS Pickering students already work with traditional, non-collaborative robots both within the classroom and in robotics competitions. Electronics and Robotics students participate in FIRST Tech Challenge, which gives students hands-on programming and prototyping experience with robot design. Working with the Baxster will give them experience with an emerging technology that they can put to use beyond a classroom environment. The students will be challenged by Omega Design to complete actual productive work tasks. “This will enable them to understand some of the differences between completing a task for productivity and efficiency versus just showing off the cool tasks it can do,” explains Siegel. Ultimately, this partnership is about developing a skilled workforce in advanced manufacturing for the future. “Careers in advanced manufacturing are good, rewarding careers,” said Siegel. “They are neat, safe, challenging and rewarding – both financially and intellectually.” Ultimately, the Baxster’s most important job is to get students thinking about their future and the many possibilities and career paths that are available to them.